The 2017 – 2018 Greater Metro Hockey League Niagara Whalers have added 21 year old Ontario Hockey League alumni Brandon Lindberg. Lindberg joins the Whalers after spending the 2016 – 2017 hockey season in Caledonia with the Greater Ontario Junior Hockey League Corvairs. Lindberg was the GOJHL's MVP and Top Scorer last season. In 2015, Brandon was Ranked #140 by NHL Central Scouting for NA Skaters for the 2015 NHL Entry Draft. 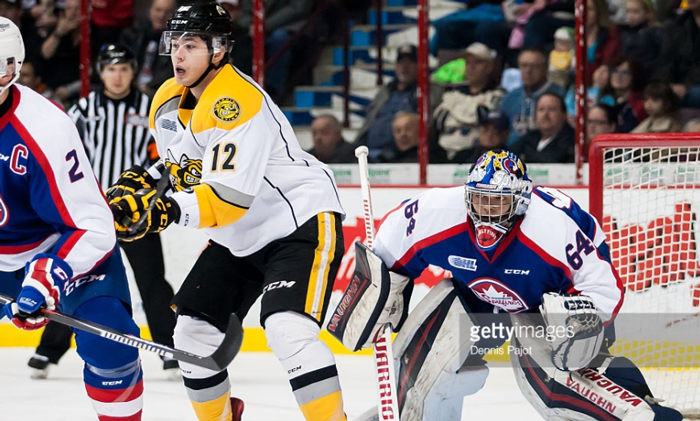 The 6’1” and 200 lbs forward spent 2012 – 2016 in the OHL with Saginaw Spirit (2012 -2014) and Sarnia Sting (2014 – 2016). In his time with the Sting, the Waterloo, Ontario native played 238 regular season games where he sank 35 goals and had 42 assists along with tallying 127 minutes in penalties. In 13 post season games with Sarnia, Lindberg had one goal and one assist. With the Corvairs in 2016 – 2017, Brandon scored 42 goals and added 67 contributors to his season total while accumulating 184 penalty minutes. In 12 play – off games in Caledonia, Lindberg who was named the 2016 – 2017 Most Valuable Player, GOJHL Top Scorer sank another five goals and added seven more assists to his season totals. In the first game as a Niagara Whaler, Lindberg found the net once while contributing one assist.